Frederick Wiegand was born in Seattle, WA on January 1, 1960 (New Year's Day). His mother was from Maine, his father from Wisconsin, yet they both happened to be living in Seattle when they met. Frederick was raised in Seattle. At the present time he teaches at Armijo High School in Fairfield, California. I had a very good childhood. Our household consisted of me, my parents, younger brother and later a dog. We regularly had our grandparents (my mother's parents) staying with us during the winters, as the Seattle winters are much milder than the winters in Maine. My aunt, my mother's sister, lived nearby with her family, so we had quite a bit of family while I was growing up. Christmas was a very exciting and wonderful time. 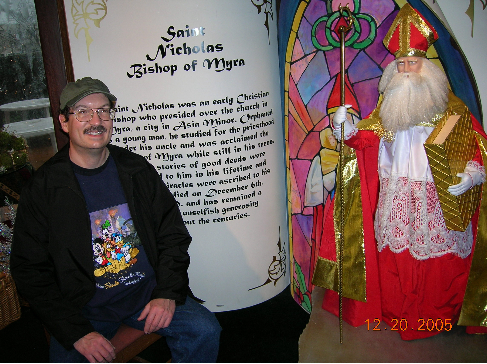 It was the many delightful Christmases that kindled my life-long fascination with Santa Claus and later St. Nicholas. To me growing up, Santa Claus was as real a person as my mother and father. I never really "stopped" believing in Santa Claus. As I grew older and a little more practical-minded, I understood the truth without being disillusioned by it in any way, as I saw in the whole Santa Claus idea the real spirit of Christmas being acted out. Now, when people ask me playfully if I believe in Santa Claus, I tell them, "I'd better...my life depends on it!" In fact, just after I had written the book Giftbringer my mother asked me how I felt about how they handled the Santa Claus issue...and I told her to wait for Christmas morning for my answer! I had made a copy of the book for her, and hadn't told her about it until she opened up the package. I think reading the book helped her to understand the profound impact belief in Santa had for me while I was growing up. Recently I discovered notes that had to have been made in the early to mid 1980s for a novel built around the story of St. Nicholas and the Dowerless Maidens. This was many, many years before I actually wrote Giftbringer, and I had completely forgotten about having made the notes. 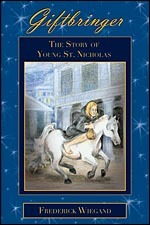 Evidently, the idea for a book, or series of books, about St. Nicholas has been with me a long, long time. My biggest interest in school was drama. In kindergarten, I acted in a production of Snow White and the Seven Dwarfs. Later, when I was in a private Lutheran school for first and second grades, I was assigned my first "starring" role--the lead in The Prodigal Son. In elementary school I took an after-school drama class, which led to some acting assignments that took my brother and me all over town. One Easter, we performed in The Curate's Play, which was a show we took to churches across the city. We must have done a dozen performances at least. I also had an audition for a film called You Like Rabbits. I think my parents were relieved that I did not end up getting cast in that film. Later, I helped write some sketches and direct plays in junior high school. In high school, I was in the musical Mame and I also won a Creative Writing award. During my senior year, my writing earned me a scholarship to a series of youth writing workshops held in Port Townsend, WA. In college, I majored in Drama. Later, I made it a double-major of Drama and English, so that I could have more options as I went into teaching. I did lots of acting during my college years, and I continued to pursue my writing as well. I wrote dozens of short stories and at least one novel. My first teaching job was in 1984 in Napa, CA. I went to Napa to visit to a friend and his wife from Seattle that had moved there. During the week I stayed with them, I interviewed at Napa Valley Christian Schools and was, to my surprise, accepted. In fact, no sooner had I arrived back in Seattle after my vacation than I received a frantic call from the superintendent virtually begging me to take the job! I did some long, hard thinking for a couple of days and decided to make the move to California. During my years at NVCS I produced several plays. 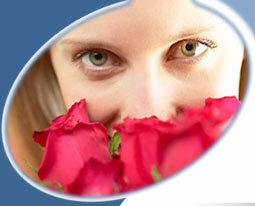 The final year I wrote a play for my students called The Flower of Knighthood. It was my first serious attempt at historical fiction. The play went over so well that my students had already committed to the next year's production before school ended. Unfortunately, during the summer a financial crisis at the school came to a head and the school closed. However, my production came together the following spring with some help from my church and my former drama students. They Also Serve, a World War II drama, went over very big with the congregation of the church and with everyone who saw it. People who had lived through the war years, after having seen my play, came up to me to share the reminiscences the play had triggered for them. With the closure of NVCS--a devastating blow at the time--I moved into other arenas. I worked for several years in the Napa court schools – juvenile hall, community school, and the Our Family drug rehabilitation program. During those years I did little dramas when I could and I also did a lot of writing. In 1997-98, I worked in Sacramento at Martins' Achievement School, a boys' school for young offenders. We actually managed to stage a couple of my plays there. In 1998, I began work at Armijo High School in Fairfield, where I am teaching to the present day. For three years I was drama teacher at Armijo, where I staged the musicals Bye Bye Birdie, Superman, and The Sound of Music among other plays. Now I am teaching Special Education English, which has been very rewarding and enjoyable. In 2002 I wrote the book Giftbringer. I am not married, but that is not due to any lack of effort on my part. It's been a long, sad story of rejections and disappointments. I really don't want to get married just for the sake of being married. If it wouldn't be a happy marriage, I don't think it would be a good idea. I still believe God has the right person waiting for me. I am not open to being anyone's second husband, however, or to raising anyone else's children. I want to be the first and only for the woman that I marry, and I want our children to be our children. My father has passed away, but my mother is still living in Seattle in the house where I grew up. My brother is married and lives in Guam with his wife and two kids, and our whole family gets together at Christmas – usually in Seattle, sometimes in Oregon. My niece and nephew are very special to me, and Christmas is still a very special time of year for all of us.